For the people of Campania region, as well as of Southern Italy, pizza is sharing joy and emotion. From the historical point of view, the pizza dates back to the beginning of the human civilization, being direct derivation of the ancient "schiacciata", prepared with different cereals, cooked between hot stones and used as an accompaniment to other dishes. It was the earliest unleavened bread for man. The word "pizza" derives from "pinsa", past participle of the Latin verb "pinsere", meaning to crush, mill. Pope Pius V's chef, in his culinary treatise dated 1570, in describing some typical dishes prepared by the Neapolitans, clearly refers to a "pizza", as "a disc of dough, no bigger than a finger that has to be cooked in oven or in a pan with no lid". The first traditional pizza was prepared with bread dough, cooked in wood oven, seasoned with garlic, lard and coarse salt. Soon after the olive oil replaced the lard, and were added cheese and herbs (the so called "moretum"); it was called "Mastunicola" if there were some basil leaves. This was the situation in the XVII century when either mozzarella or tomato did not appear among the ingredients of the "schiacciata": they were used from the second half of the XIX century. The turning point was 1889 when Naples pizzerias started to produce three different kind of pizzas: the pizza "alla vasenicola" (with lard, cheese and basil), pizza "alla marinara" (with tomato, garlic, olive oil and oregano) and pizza "alla margherita" (with tomato, mozzarella and basil leaves). 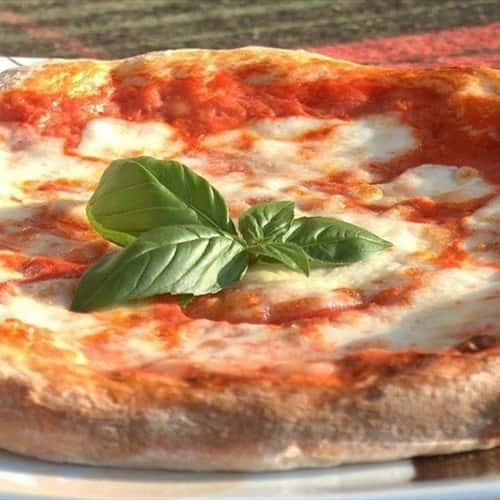 According to tradition, the pizza margherita is named after Queen Margherita of Savoy, wife of king Umberto I, who, during their stay in Naples, on June 9 1889 wanted to enjoy the pizza prepared by the best pizza makers of the city, don Raffaele Esposito and Rosa Brandi, owners of a pizzeria in Via Chiaia. What is the link between pizza and Tramonti, mountain town of the Amalfi Coast, nestled among the Lattari Mounts? 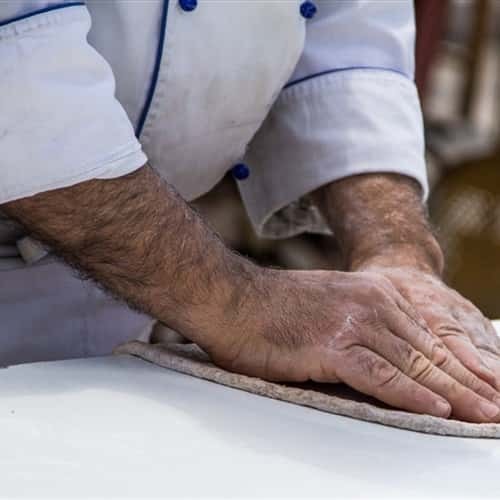 Tramonti can be defined "the home of pizzaioli" thank to over 3000 pizzerias run by Tramonti pizza makers, both in Italy and abroad, becoming the ambassadors of local culinary tradition. During the Middle Ages, in Tramonti was prepared a kind of pizza with rye flour, germanella, millet and barley flour, seasoned with spices and pork lard and cooked in rural ovens. 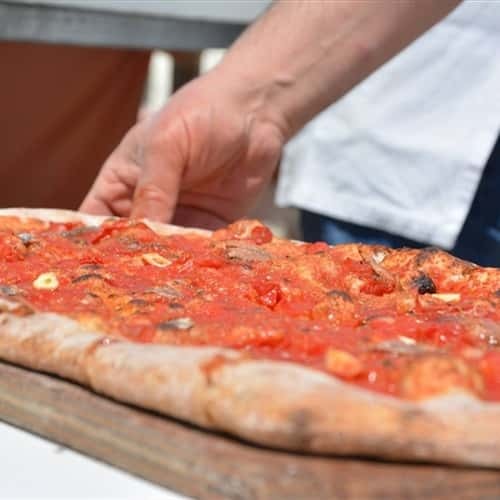 In the following centuries the pizza was served with piennolo tomatoes, extra virgin olive oil, garlic, oregano and anchovies. After the Second World War, many people from Tramonti emigrated to the cities of Northern Italy in search of fortune. Luigi Giordano can be considered the pioneer of this new tasty adventure: he was, in fact, the first pizzaiolo who prepared the traditional Tramonti "schiacciata" with the addition of fior di latte beyond the boundaries of the Amalfi Coast. With De.Co. label (municipal designation), the municipality of Tramonti wanted to preserve the historical memory as well as to establish the ingredients of its traditional pizza, prepared with selected tomatoes, fior di latte from the Lattari Mounts and PDO extra virgin olive oil "Colline Salernitane".